Phone leads are often the most valuable to sales. 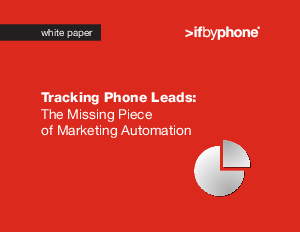 But most marketers don’t know how they generate inbound calls – and conventional marketing automation tools can’t track phone leads. When you can’t track phone leads back to specific campaigns, you can’t take credit for the revenue they bring in. And you risk wasting budget renewing ads that aren’t working. Don’t waste money on ads that aren’t working – and never pull the plug on ones that are. Download the white paper now.